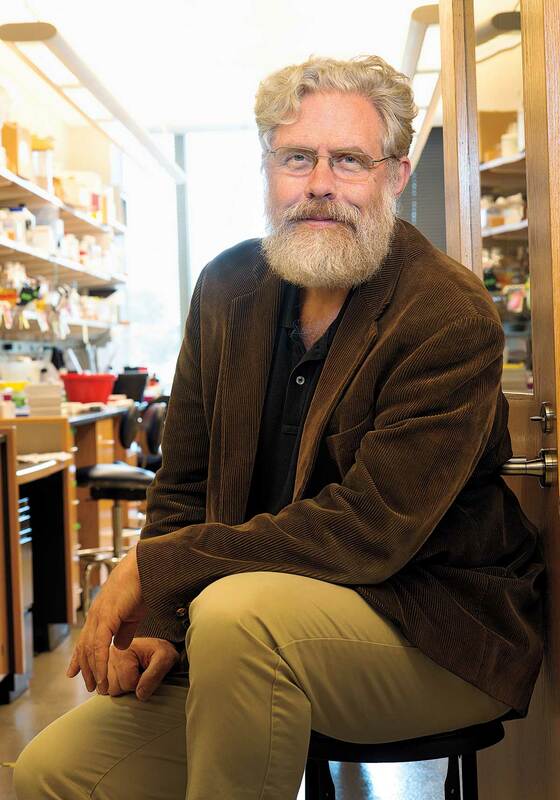 George Church’s lab has reengineered the genetic code of the bacterium Escherichia coli to make it resistant to viral infection. 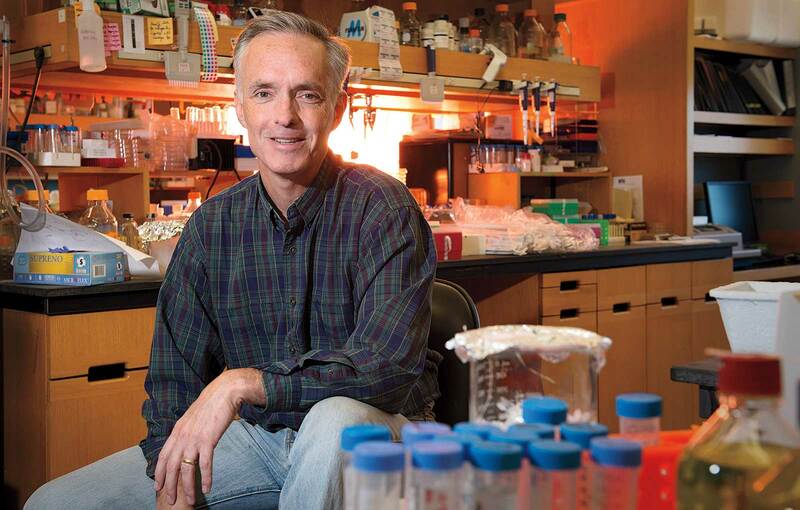 Jeffrey Way is part of a team that engineered cyanobacteria to produce sugars from photosynthesis more efficiently. Pamela A. Silver and colleagues engineered bacteria that detect and report on the presence of a certain molecule in a mouse’s gut. James J. Collins led a team that built a genetic toggle switch, a first step to constructing biological circuits and computers. In the summer of 2009, a team of Cambridge University undergraduates built seven strains of the bacterium Escherichia coli, one in each color of the rainbow. Red and orange carotenoid pigments were produced by inserting genes from plant pathogen Pantoea ananatis; a cluster of genes from Chromobacterium violaceum were likewise modified to yield green and purple. The students’ technicolor creations, dubbed “E. chromi” in reference to the organisms’ scientific name, won the Cambridge team the grand prize at that year’s International Genetically Engineered Machines (iGEM) competition, in which high-school and college students engineer biology. The students’ goals were not merely chromatic. Instead, they were building parts for biological machines. They engineered the genes into standardized forms called BioBricks: pieces of DNA that, like genetic Legos, are designed to be mixed and matched at will. Several thousand of these BioBricks, fulfilling various functions, are already housed in the MIT-based Registry of Standard Biological Parts. Some BioBricks detect chemicals like arsenic; others act as “tuners” that determine the threshold level of chemical input needed to turn on a certain gene. By combining the new color-producing genes with existing parts, the thinking went, one might easily construct biosensors that, in the presence of environmental toxins, produce output visible to the naked eye. “E. chromi” struck a chord with designers Alexandra Daisy Ginsberg, G ’06, and James King, who began a collaboration with the iGEM team. In a short video that was named best documentary at the Bio:Fiction synthetic biology film festival in 2011, Ginsberg and King imagined possible futures for living color. Soon, they suggested, scientists might search the natural world for new biological pigments and the genes responsible, revolutionizing dye production. “E. chromi” in probiotic yogurt might monitor human disease while traveling through the gut; microbes in the atmosphere might change color to indicate air quality. Insofar as a common theme unites these diverse creations, it is the transformation of biology into an engineering discipline. Traditional genetic engineering amounted more or less to biological cut-and-paste: scientists could, for instance, transfer a cold-tolerance gene from an Arctic fish into a tomato. 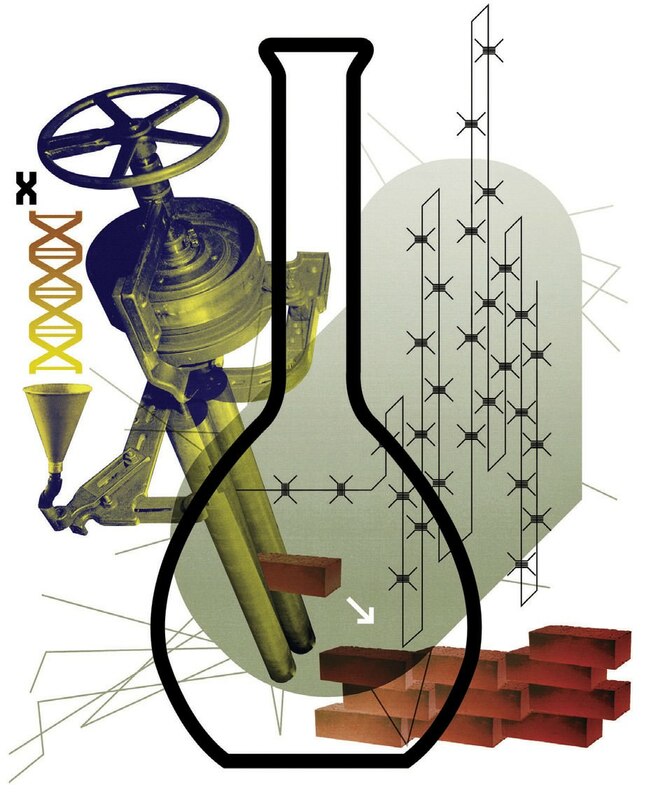 Synthetic biology aims for a more radical reorganization. Its organisms are built to be biological machines, with DNA and proteins standing in for circuit components or lines of computer code. In combination, the biological parts perform functions unknown to nature: processing signals, producing new chemicals, storing information. Understanding and manipulating this elaborate machinery is a tough job. “I think of it as if some alien intelligence just dropped onto us all their intellectual property without documentation,” says George Church, Winthrop professor of genetics at HMS (see “DNA as Data,”  January-February 2004, page 44). There’s no direct biological equivalent of a capacitor or the delete command, and synthetic biologists must creatively recombine existing biological parts in order to build new functions. Take, for instance, the toggle switch, one of the simplest circuit components. A nonbiological example would be a light switch: it can be flipped between two discrete states, on or off, with nothing in between. In an abstract sense, the toggle switch amounts to a kind of memory, with its two states tantamount to 0’s and 1’s. Such bistability has some analogues in nature. Venus fly traps, for instance, have structures that alternate between open and shut (see “Leaves That Lunch,”  May-June 2005, page 14). Specific signals instruct cells whether to remain dormant or divide. Some viruses also toggle between two distinct states of dormancy or active infection. Sometimes life is just too hard to understand. Such was the conclusion of current Stanford professor Drew Endy, then at MIT, after several years spent trying to computationally model the bacteriophage T7. The virus is one of the simplest and most well-studied biological systems, and after 60 years of research, Endy thought, scientists should have T7 down to a T. But this proved far from so: his simulations, which sought to predict how mutations would affect viral development, simply did not match experimental results. Faced with biological complexity, Endy decided to get rid of it. In 2005, he and collaborators published a report on a virus they dubbed “T7.1,” a version of T7 they designed to be easy to understand and manipulate. Evolution may have been responsible for the diversity of biological functions, but to a human scientist, those functions could appear byzantine and impossible to comprehend, let alone engineer. T7, for instance, had multiple overlapping genes, meaning that mutations in one gene could affect others in unpredictable ways. Endy’s team built “T7.1,” by separating the virus’s genes into discrete parts—all the better for rational design. “T7.1” survived its massive genome reordering, though barely. Compared to T7, its fitness was considerably reduced. Other researchers are focusing on building chassis chromosomes. “Imagine if you had a piece of DNA, and you knew everything about it—there were no mysteries,” says Silver. 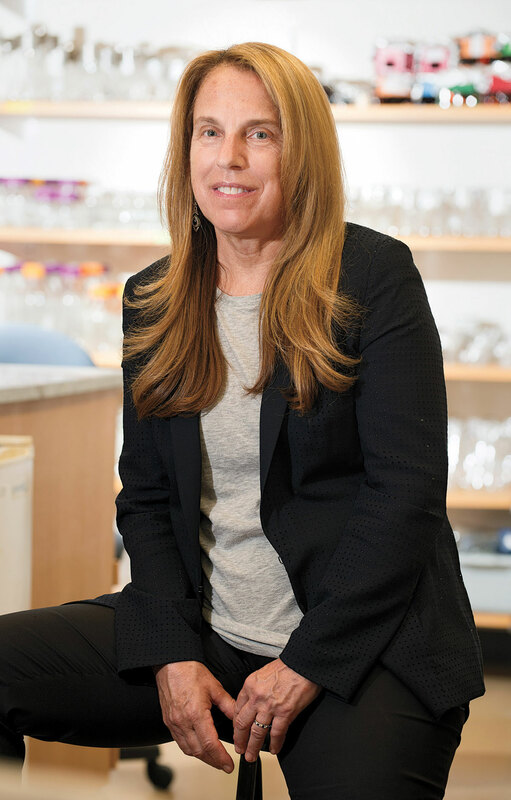 Her lab is working with the Venter Institute to design a mammalian artificial chromosome, in which the complex processes of mammalian gene regulation would be more fully characterized and understood. Earlier this year, researchers from New York University and Johns Hopkins announced the creation of an artificial yeast chromosome, with nearly one in six base pairs of the genetic scaffold modified to make genes easier to insert and remove. The artificial chromosome is the first step in building synthetic yeast, whose entire genome is similarly redesigned. Such massive genome remodeling also lends itself to more radical possibilities. Church’s lab, for instance, is working to alter the genetic code. All living things have cellular machinery that interprets DNA instructions, mapping three-nucleotide sequences called codons into the amino acids that make up proteins. In 2011, Church’s group reported that it had massively reengineered the E. coli genome, replacing each instance of the codon “TAG” with “TAA” (see “Life: The Edited Version,”  November-December 2011, page 14). Both are stop codons, signaling that a series of genetic instructions is complete, but each codon is interpreted using different cellular machinery. With the “TAG” codon now gone, the researchers deleted the machinery that handled its translation. In its absence, if a virus were to invade the engineered organism—dubbed “rE. coli”—the viral “TAG” codons would be ignored, dooming its attempted infection. Using techniques like those that built “rE. coli,” Church says, it might someday be possible to engineer humans to be similarly virus-free. One of the most disquieting acts of whole-scale biological recreation came in 2002, when researchers were able to produce live, infectious poliovirus by synthesizing its genome. In 2005, researchers at the Centers for Disease Control and Prevention used similar methods to reconstruct the virus responsible for the 1918 pandemic of Spanish flu. In 2006, using private addresses and identities, reporters from The Guardian were able to mail-order a small segment of the smallpox genome, though additional equipment and expertise would have been required to assemble the entire genome and bring the virus to life. Church’s lab works actively on both building and testing the biological equivalents of seat belts, which might be designed into future chassis organisms. 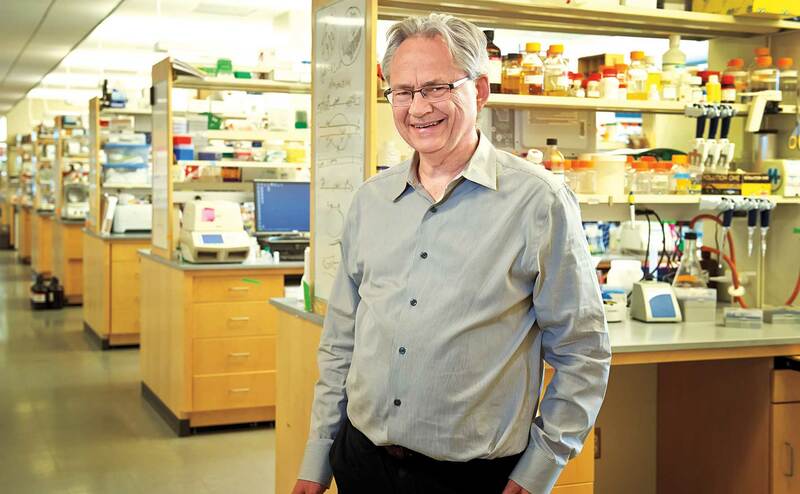 “We’re building genetically modified organisms that can’t escape and can’t influence the ecosystem because they are genetically and metabolically isolated,” he says. “They’re on a very short leash.” With an altered genetic code, he argues, a synthetic organism could neither give nor receive DNA, since it would process genetic instructions differently from its wild relatives. His lab’s genetically recoded “rE. coli” is already unable to live more than a few minutes without an inexpensive compound that is only available in the lab, says Church. Moreover, “we’re building more radically recoded organisms that literally can’t use natural DNA from their environment, since it must be processed by cellular machinery thatthese organisms lack.” Collins’s lab has devised another solution, developing a genetic “kill switch” that responds to certain chemicals by producing toxic proteins that kill the cell. Other safeguards for synthetic biology are under construction, and many of them are, likewise, self-imposed. After The Guardian exposed the ease of ordering pathogens’ DNA, DNA-synthesis companies voluntarily created collaborative consortia to screen orders against databases of known pathogens and toxins and to flag suspicious behavior. All competitors in the iGEM bioengineering competition are required to submit their projects for review by a safety committee, which works with teams to modify projects that provoke concern, and several federal agencies have also sponsored educational programs to sensitize competitors to biosecurity issues. Indeed, says Oye, synthetic biology is on its way to developing what he calls a “culture of responsibility.” It aims to augment rather than supplant traditional regulatory measures, he says, and can influence both the nature of regulation and how researchers think about the projects they pursue. For instance, when Silver and Way led a team that engineered cyanobacteria to more efficiently produce sugars via photosynthesis, their team and Oye’s group conducted a joint risk-assessment exercise. Ecologists, microbiologists, and regulators from the Environmental Protection Agency came together to discuss the environmental implications of release of the engineered organisms, with attention to competition with wild bacteria, for instance, as well as potential gene transfer and evolution. Questions of scientific responsibility featured prominently in the 1970s, when similar concerns arose as scientists began learning how to manipulate organisms’ genes. In 1974, researchers working on genetic engineering undertook a voluntary moratorium to assess the impacts of their work, a moratorium that ended with the convening of the landmark 1975 Asilomar Conference on Recombinant DNA. There, a group of leading molecular biologists discussed safeguards for the new field, designating avenues of research that should not be pursued and settling on a self-imposed strategy of containment to reduce the risk that engineered organisms would escape the lab. Asilomar’s attendees were almost entirely molecular biologists, and as a result, the scope of the conference’s debate was considerably narrowed, argues Pforzheimer professor of science and technology Sheila Jasanoff—Hurlbut’s graduate adviser and editor of Dreamscapes of Modernity—in her 2005 book Designs on Nature: Science and Democracy in Europe and the United States. Asilomar purposefully bracketed questions of ethics and bioterrorism, she says. On legal issues, conference attendees focused primarily on product regulation and risk assessment, leaving aside more general questions around the processes by which the organisms were created. Jasanoff cautions that, compared to earlier federally funded research initiatives like the Human Genome Project and the National Nanotechnology Initiative, Synberc has far fewer avenues of funding available for unaffiliated researchers to study synthetic biology’s legal, social, and ethical implications. The consortium’s primary principal investigators (13 currently, including Silver and Church) are chosen from the program’s five university partners—the Universities of California at Berkeley and at San Francisco, as well as Stanford, Harvard, and MIT—and they nominate and vote to approve other affiliated researchers; Oye is the only primary researcher who is not an engineer. One pointed answer came from activist Vandana Shiva, as quoted in the declaration “Principles for the Oversight of Synthetic Biology,” released by the environmental group Friends of the Earth. “Synthetic biology, the next wave of genetic engineering,” she wrote, “allows seed, pesticide and oil companies to redesign life so that they can make more money from it.” Indeed, on the point of ownership, synthetic biology evidences deep divides. Some strands of synthetic biology have aligned themselves closely with open-source ideals. The BioBricks Foundation has the mission of making its biological parts available for free, and it hosts OpenWetWare, the field’s version of Wikipedia, complete with experimental protocols and lab notebooks, sometimes in exhaustive detail. By contrast, the Venter Institute has filed for a patent on the minimal “Mycoplasma laboratorium” genome, prompting legal challenges in response. No surprise, then, that synthetic biology has exerted such an outsize influence on the public imagination. 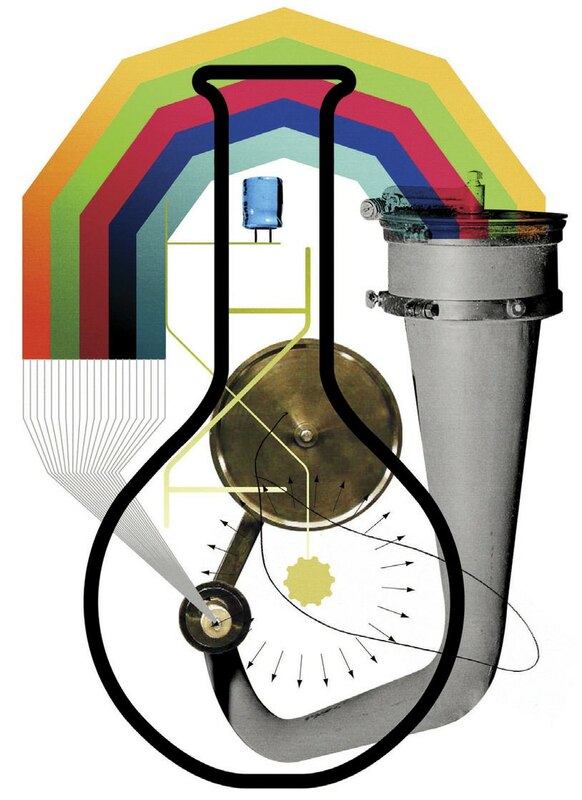 The National Science Foundation has sponsored an initiative called “Synthetic Aesthetics” that pairs research scientists with designers; its initial products were published this spring in a coffee-table book of the same name. The first synthetic biology film festival, in 2011, drew 130 entries, and a second will take place in Vienna this October. This year, iGEM drew 245 collegiate and 54 high-school teams; an estimated 15,000 students, instructors, and advisers have participated in the competition since its beginnings as a January course at MIT in 2003. Last year, in a crowd-funded campaign, a community lab in San Francisco called BioCurious raised nearly half a million dollars to build plants that glow; seeds are slated to reach the market this fall. Perhaps at its core, synthetic biology is a space upon which scientists and nonscientists alike project their own imaginings. For biologists, it means a rethinking of metaphors. If a cell is a computer and genes are circuits, then what will be the nature of the new menagerie? Elsewhere in the public consciousness, synthetic biology has found itself at the center of many social debates about the proper role of science and technology, highlighting and often undermining the established manner in which biology has been done, demanding an answer to the question of what is next. 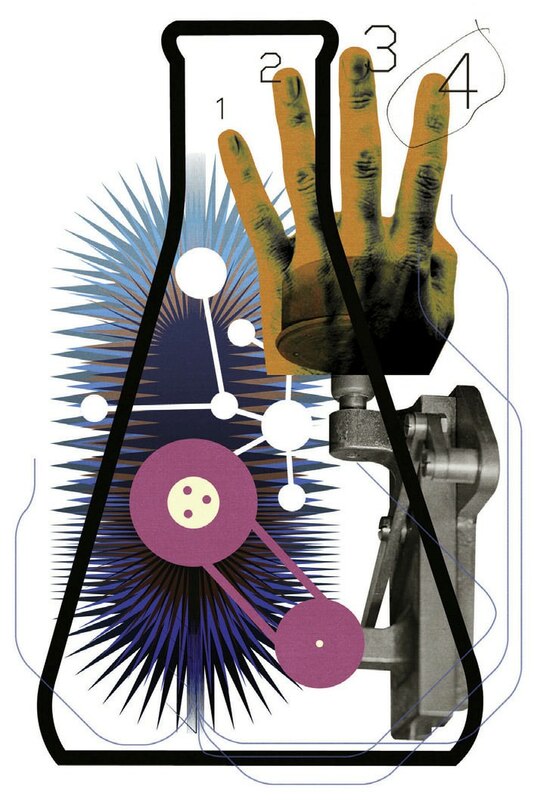 It is perhaps fitting that synthetic biology has taken on a life of its own. Updated August 29, 2014: An incorrect reference to physicist Freeman Dyson as a Nobel laureate has been removed. We regret the error. Former associate editor Katherine Xue ’13 has entered the genome-sciences doctoral program at the University of Washington.